Convenience stores have long been the top retail channel for cigarette sales, but for many c-store retailers the real growth opportunity is selling products designed to help consumers quit smoking. According to the FDA, more than 22 million smokers each year say they want to quit smoking. Millions of people are turning to nicotine-replacement therapy (NRT) products like nicotine gum to help them break the habit. Last year, Food/Drug/Mass (FDM) retailers sold nearly $1 billion of NRT products, but convenience stores only sold $25 million. This gap in retail sales represents a huge opportunity for Convenience Stores to gain their share of nicotine gum sales. In the past few years, thanks to aggressive campaigns targeting the health risks of smoking, more consumers have been looking to quit permanently. The long-term risks of smoking tobacco are well known at this point, but consumers are finding other reasons to give up the habit—including the ever-rising cost of cigarettes, which, in many places, has steeply increased. According to Nielsen retail data, c-stores are the dominant retail channel for tobacco, with a nearly 87% share of unit sales. However, shifting trends could drive more operators to make a change in their product offerings. Sales of cigarettes have been declining for years, so offering smoking cessation products presents a significant opportunity to offset that trend and generate incremental sales. With more reasons to quit smoking than ever, consumers are researching different ways to beat the habit. A wide range of different products is available to help people quit, including prescription medications and NRT products such as nicotine gum, patches, inhalers and nasal sprays. However, nicotine gum accounts for more than 55% of NRT product sales, indicating that nicotine gum is the preferred form for smokers who are trying to quit. Nicotine gum is ideally suited for busy c-store shoppers who may want to calm nicotine cravings when they are on the road or when they are at work. Brands like NicotacTM are sold in convenient 10-piece packs that can be easily carried in a pocket or purse. Flavor variety is important too, so be sure to stock popular choices like cinnamon, mint and fruit. 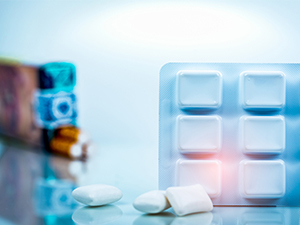 Not all nicotine gum is created equal, either, as two-milligram and four-milligram nicotine gum strengths are available to meet the needs of light and heavy smokers. In order to capture incremental sales, c-store retailers should make nicotine gum clearly visible to smokers. If an ex-smoker is on the go and craving a cigarette, they need to know that nicotine gum is available and affordable. Lil’ Drug Store Products, marketers of NicotacTM brand nicotine gum, recommends placing displays at the check-out counter near other tobacco products. Additional ways to boost awareness are in-store signage featuring nicotine gum flavors or price promotions. Clearly visible signage and display placement near the checkout counter and tobacco products shelves can reinforce the idea that consumers have choices when they are trying to quit smoking. The potential for millions of incremental dollar sales and the increased satisfaction of loyal customers can be achieved by simply having nicotine gum readily available at c-store checkout counters.